Uttaranchal: A Dehradun-based pathology and imaging centre has been held guilty of erroneously concluding that a patient had breast cancer and consequently fined Rs 10 lakh plus interest by the State Consumer Commission. The patient had undergone mastectomy based on the report. The case goes back to 2003, when the complainant was having pain near her breast and visited. Dr. Pradeep Sharda, M.S., F.A.I.S. and F.I.C.S. for check-up. The doctor referred her to Dr. Ahuja’s Pathology & Imaging Centre for further tests. Dr. Alok Ahuja is a qualified doctor and is M.B.B.S., D.M.R.E., M.D. and Consultant Radiologist running the centre. Dr Ahuja took the blood sample of the complainant and did fine needle aspiration biopsy and the result was suggested as excision biopsy. On 20.05.2003, the doctor took the specimen of breast lump for further test and declared infiltrating ductal carcinoma. Based on the reports, the patient went to Rajiv Gandhi Cancer Institute and Research Centre (RGCIRC), New Delhi for treatment. The said hospital, relying upon the report dated 20.05.2003 , took the complainant for surgery and removed her left side breast. During operation, the specimen of left MRM was sent for biopsy and vide report dated 09.06.2003, it was reported that, “Diagnosed case of carcinoma breast. No residual tumour tissue seen in the breast. Axillary Lymphnodes, Level II, III tissue are free of tumour tissue”. “Three of the slides show skin with unremarkable epidermis and dermis showing well circumscribed lobular mass composed of round to oval cells with eosinophilic cytoplasm and centrally places round nuclei. Some of the cells have clear cytoplasm. Compressed cuboidal to flattened cell lined Lumina are noted in the midst of lobules. The stroma is compressed. No breast tissue is noted. No evidence of malignancy is seen. The fourth slide shows a strip of muscular tissue lined by a layer of columnar epithelium thrown in papillary projections. No specific lesion is noted”. “Microsections show a capsulated intradermal tumour composed of lobular masses with extension into subcutaneous fat. Tumour lobules comprise of polygonal to fusiform cells with amphophilic to vacuolated cytoplasm. No nuclear hyperchromasia, mitosis and necrosis seen. A few cystic spaces and ducts are seen. Thin vessels are present in the tumour. Epidermis is unremarkable. One large duct lined by cuboidal cells is seen adjoining the tumour tissue”. In the impression, it was reported that, “Benign adnexal tumour. Suggestive of benign sweat gland tumour”. Based on the above two reports that patient filed a medical negligence case against all the doctors and hospitals involved, and failure of proper test report and diagnosis which caused the patient to undergo painful treatment. In their defence, the pathology lab stated that the said pathology report was suggestive and the complainant was specifically advised to take second opinion before determining course of treatment and that is why original slides were handed over to the patient on 30.05.2003. Moreover it was stated that that the portion which was examined by pathology lab was breast lump, while the specimen examined by Dr. Lal Path Labs Pvt. Ltd. was skin nodule; that there is quite possibility that the observation regarding two different specimen may have varied; that there is always a scope or space for difference of opinion and there are limitations of pathological study, which were explained to the complainant while handing over the slide on 30.05.2003; that there is a possibility that the breast lump which was examined by the pathology lab suggested malignancy, while the skin nodule examined after breast removal, may have contained no malignance cell, as the stage of the patient was detected at the very early stage; that the specimen of excision biopsy was submitted on 20.05.2003 and the specimen was processed as per standard protocol and a comment of infiltrating duct carcinoma was proposed. The report dated 20.05.2003 of the complainant issued by Dr. Ahuja’s Pathology & Imaging Centre is Paper No. 14 on the record and in the said report, it has clearly been mentioned that the complainant is having “infiltrating ductal carcinoma” i.e., breast cancer. There is no mention in the said report that the findings are suggestive and that the complainant should go for second opinion before taking further treatment for curing the disease mentioned in the report. In para 12 of the written statement, it has further been stated that there is a clear possibility that the breast lump which were examined by the opposite party Nos. 1 and 2 suggested malignancy, while the skin nodules examined after removal of breast may have contained no malignance cell, as the stage of patient was detected at the very early stage. If the complainant was suffering from an early stage of cancer, the said fact should have been mentioned in the report and she should have been clearly informed that there are chances that she might be suffering from breast cancer, but the said fact should first be got confirmed by way of second opinion and thereafter, further course of treatment should be followed by the complainant, but there is no such mention in the report, nor there is any remark that the finding is suggestive or the diagnosis found is at the early stage and the complainant need not worry about the same. In the report dated 11.12.2003 issued by Dr. Lal Path Labs Pvt. Ltd., it has clearly been mentioned that the impression is suggestive of benign sweat gland tumour, but there is no word like “suggestive” mentioned in the report issued by opposite party Nos. 1 and 2. Thus, there has clearly been medical negligence on the part of the opposite party Nos. 1 and 2 in issuing a wrong pathology report showing that the complainant is suffering from breast cancer and on account of the said incorrect report, the complainant was operated upon and her left breast was removed. 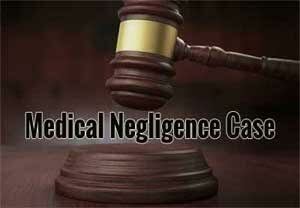 Holding negligence the court directed the pathology lab and Dr Ahuja to pay compensation of Rs. 10,00,000/- to the complainant together with interest @7% p.a. from 29.04.2006, i.e., the date of filing of the consumer complaint till payment and Rs. 10,000/- towards litigation expenses. The consumer complaint is, however, dismissed against Rajiv Gandhi Cancer Institute. Despite reports available it took 15 years. There is this case from Delhi where a male person, who was completely alright, was administered deadly steroids, poisons without his permission and knowledge as part of illegal clinical trials and then later even the report was not supplied despite asking for it many times. What does the victim do? His complete work came to stop, his life was halted, his body secretions were altered etc. His heart was weakened. Poisons were administered to finish off the heart, brain, nerves, mind. And a retired Indian Army Brigadier acted as the henchman here! With such Army Men on the prowl in civilian life, it is indeed very difficult. The one who is looked upon to protect – that person himself becomes predator, and all because heavy international funding reached Brigadier Sudarsanan via hawala channels. See ww dot KindAttentionMCI dot blogspot dot com . What to do now? It\’s 10 years gone, and counting. I think it should be important to learn for every medical professional to work in safe mode. In this view every doctor working in diagnostics need to be careful for reporting pattern and use appropriate words as per legal indications . Never provide straight forward diagnosis . Always write there may be possibility and also write differential diagnosis. I am also following such practise since last 4 year in diagnosis. Law is blind it never think about practicability of medical field. It always work on documentation and evidence. With due regards for the learned court\’s judgement, in light of derailed totality of the case on record, it would appear that Rajiv Gandhi Cancer Institute and Research Center, an advanced super-specialty institution, did not review to confirm the diagnosis/otherwise, before going in for mastectomy. This should have been the protocol of standard operating procedures making them accountable for whole cause and effect relationship of medical care, particularly in the field of oncology. Treatment of cancer is often worse than disease and all workers of such accredited centers, with advanced facilities including diagnostics, are deemed to be an authority in their fields of specialization. Mandatory confirmation of even a correct diagnosis from peripheral specialized histopathology lab would act as prudent filter for such happenings or at least change the institutional liability of consequent management. Role of another third lab (Dr Lal\’s) in confirmation / contradiction in diagnosis is not clear. Is there any medical expert adviser in the consumer court ? Can not comment unless we get to see all or atleast the original histopathology report. The surgeon should have sought the second opinion by pathologist prior to mastectomy, which I do in all cases when the report is from another centre. Question is if u miss cancer and if there is false positive . Should medical report b 100% accurate to prevent litigation .